The Oak Flat Loop is located in the Black Canyon of the Gunnison National Park near Montrose, Colorado. The loop is a very popular hiking trail during the summer months for its breathtaking views of the Black Canyon and because it is one of the few places where hikers can venture below the rim of the canyon without a wilderness permit. The Black Canyon is also popular during the winter months by many cross country skiers and snowshoers. During the winter the Parks Service waves the entrance fee and keeps the road plowed all the way to the South Rim Visitor Center. The road past the Visitor Center is groomed for cross country skiing as long as there is sufficient snow. As far as the Oak Flat Loop goes, it begins near the northwest corner of the building. Before starting out it is a good idea to stop inside the Visitor Center and inquire about the current conditions of the trail. On the day that we were there taking photos for this post the Ranger convinced us that ice cleats would be a better choice than snowshoes. If you don't have ice cleats they will gladly loan you a pair. The trail heads out through the oakbrush toward where the loop begins. For this post we are opting to follow the loop in the clockwise direction. The last time that we were here we went counterclockwise so this time we will try going the opposite way. Once the loop gets started the trail travels around its western side and comes to the point where the Uplands trail branches off on the left. There are some good views through the trees of the canyon as the trail continues. Traveling along the west side of the loop there is a spot where the trail gets very narrow. Slipping off the trail in certain places would not result in a good outcome. A person wouldn't slide all the way into the canyon but it would probably be 30 or 40 feet before they stopped and by then they might have broken a few bones and need rescued. It's one of those places where you have to judge for yourself before proceeding. 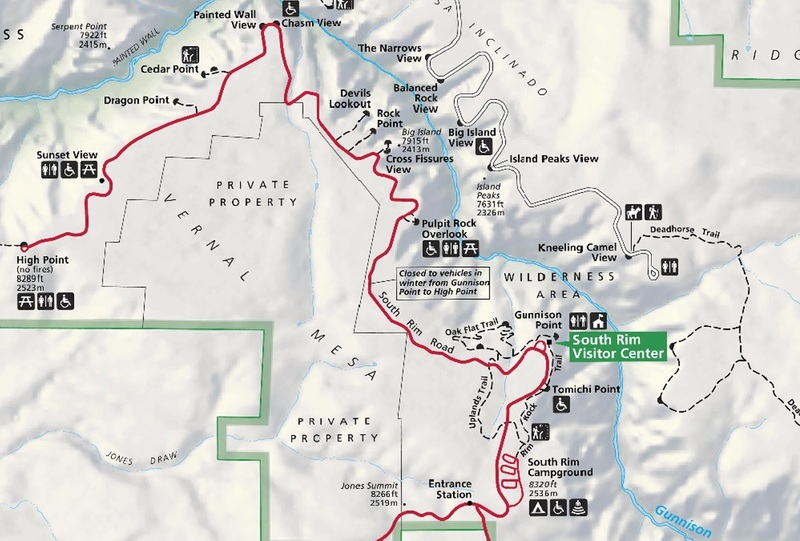 Even if you decide it isn't for you and choose to turn around you will already have had the chance to peer all the way down into the canyon and see the Gunnison River flowing by some 2,000 feet below. After the narrow stretch that has the uncomfortable exposure the trail leaves the trees and begins dropping a little further below the rim. The trail meanders around quite a bit making use of switchbacks to get down the steeper spots. Eventually the trail makes its way all the way down to Oak Flats where the views of the canyon are a lot more up close and personal. As the trail continues around the loop climbing out it passes the spot where the Wilderness trail that goes all the way down to the river begins. From there the trail takes a more direct route back up to the rim than it did getting down to Oak Flat. We got the impression that the Ranger hiked the trails regularly enough to know what condition they were in. On the day that we were there we found quite a few tracks to follow and the snow was well packed. We were wearing boot cleats just like the ones they loan out but if I were to do it again I would probably wear my crampons that are also good for ice climbing. They would dig into the trail a lot better. 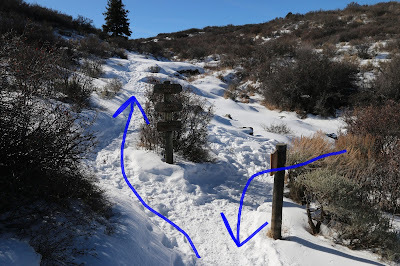 Sometimes when you are on steep terrain with snowshoes they can turn into a pair of skis if they lose their bite on the snow and that would be something to be wary of on this trail. A person could always just go down the east side of the trail to Oak Flat and not do the entire loop. That part of the trail is quite a bit shorter and much easier in comparison. Whatever you decide if you would like to see it for yourself then all you have to do is 'Take a hike'.